This is a 2-part tattoo story. 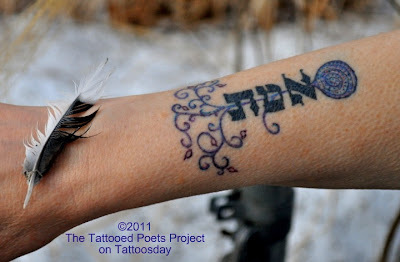 On my 54th birthday, I had the Hebrew word for truth (emet) imprinted on my right (i.e., writing) forearm in traditional black Torah script. 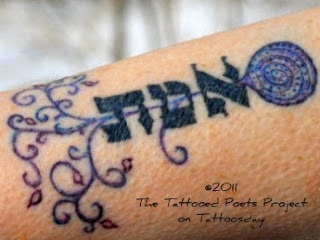 I wanted a useful reminder for my art; also the word contains one letter that is a stand-in for life/God and two others that spell out the word “dead”. Okay, it was a little heavy. Two years later, this past November, when I couldn’t take looking at the damn truth anymore, Dina Verplank of Voluta Tattoo in Indianapolis beautified the baldness of the lone word with a branch from the Tree of Life and a spiral/root system. Damn. Another 3 a.m. flying dream. covered with large plastic pigs and spiked coat hangers. This is not what normal people dream. though not one legible note of navigational instruction. Seamlessly, one might say, and with understated finesse. In the realm of normal. My dead have secrets. That much is abundantly clear. they’ve come while I’m asleep. Bad timing is all I’ve got. That, and fingerprints left on the towels. claim these people as kin? How else to name my own impurities and small derangements? Sue Swartz is a poet, hired-gun-political writer, amateur ballroom dancer, favored grandparent, social justice activist, occasional yogini, and creator of alternative Jewish ritual. Her work has been published in Cutthroat Magazine, Lilith, 5 a.m., SmartishPace, and elsewhere. She wishes she had a book you could buy. You can find her blog Awkward Offerings at http://swartzsue.wordpress.com/. She makes her home in Bloomington, Indiana and believes that Leviticus (You are not to make gashes in your flesh for the dead nor incise marks on yourself.) goes a bit overboard. Thanks to Sue for sharing her truthful tattoo with us here on Tattoosday!